We progress. 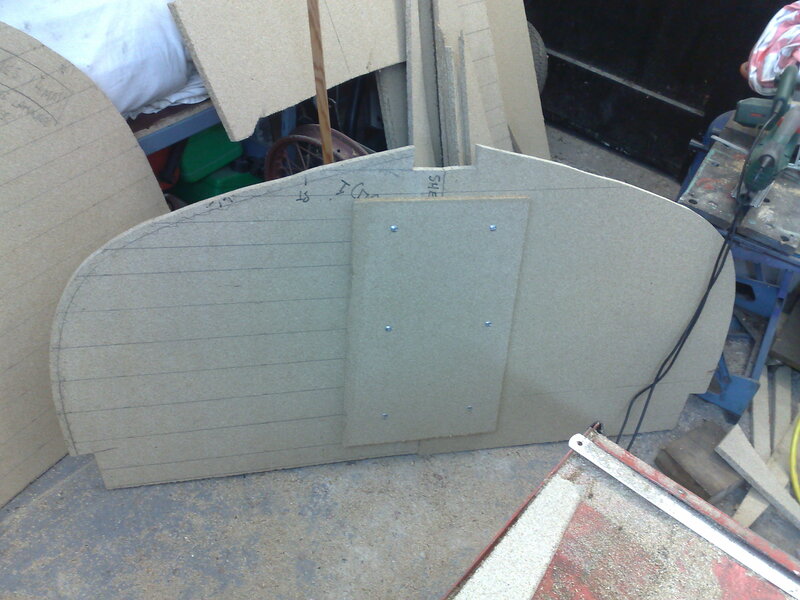 Having cut the first 7 sheets of chipboard into panels sized to provide the first half-moulds we set about marking them and cutting them out. these a distance from the centerline of the boat to the edge of the mould. So the first step was to produce a “ruler” with these “vertical offsets” from the waterline marked. 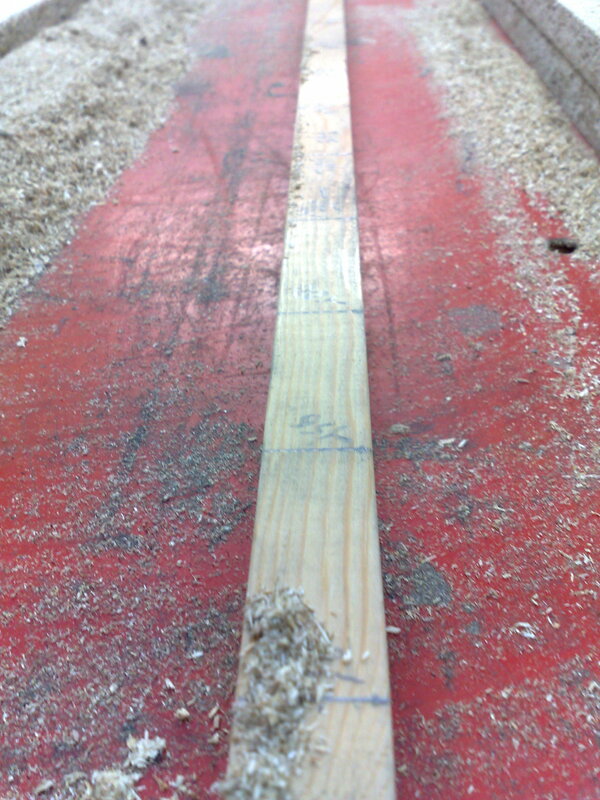 Having first located the waterline on each sheet (by treating one edge of the sheet as the bottom of the hull and then measuring up to the waterline datum position), the ruler is then used to mark the positions (and then draw in) the horizontal lines on which the offsets will be measured. 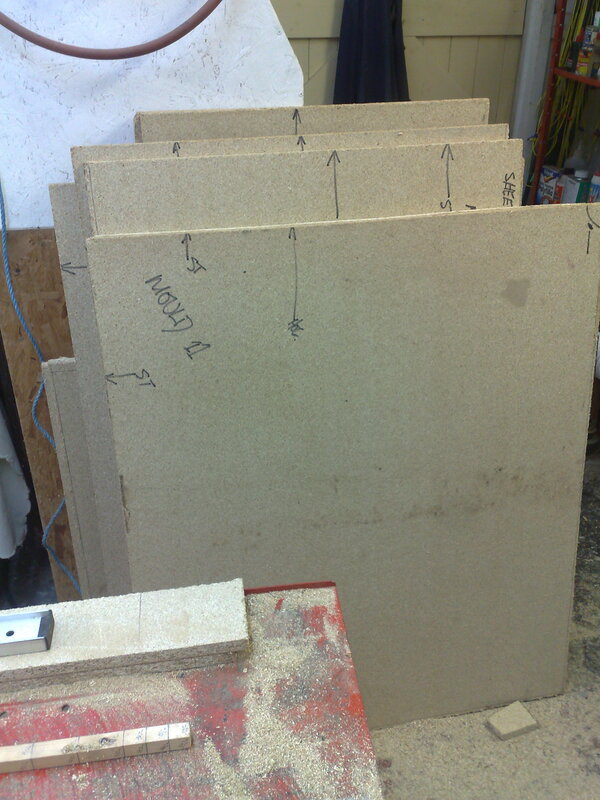 Then measure and mark the offsets onto the boards. Once this is done I then nailed small panel pins into some of these locations and used them to locate and bend a batten (I used a bit of the plastic finishing strip from a laminate flooring project) to the shape of the edge of the mould. It soon became clear that the batten needed holding against the mould in a couple of places, so bent scraps of ally were srewed into the chipboard to hold everything in place. This bit was VERY satisfying, as you could see how the batten automatically took up a smooth (fair?) curve that passed thru the other marked points. I had miss located acouple of points but these became immediatly visible (because the batten “missed” them by a mile). My plan is to laminate the frames/ribs onto the moulds before planking, so I chose a batten which was the same thickness as the frames (ribs), so for the moulds that were located where the frames were to be located I drew the cutting curve on the inside of the mould and for the moulds where the frames were not located I drew to the outside of the batten. (I am still a bit nervous about the actual thickness of the frames, as I can’t see this marked on the drawings, so I am awaiting an answer from Mr Fisher when he returns to his offices next week). Actually I spent most of a day computing a set of offsets for the moulds with ribs, but the math was pretty complex, and so in the end I adopted Louise’s suggestion of drawing the inner mould shape from the outer one, as described above! Removing the batten left some very boat shaped lines on the moulds – then I marked on the hog and clamp cutouts ready for cutting (again these are fitted before the planks) … filled with positive vibes I clamped the mould halves in pairs and picked up the jig-saw and things to a turn for the worse! This entry was posted in Hull Build and tagged frames, moulds, progress, technique on July 7, 2011 by sybefur. Again, we did not fit the frames/ribs to the moulds (as there were none). So, the moulds were just cut to match the plans exactly.